Dueling Princes is the third book in the Calypso Chronicles series. If you like the first two, you'll like this one. Similarly, if you didn't like the first two, you won't like this one. I think there's a time and place for mindlessly fun reads and this certainly is that. There's a lot to criticize about these books if you want to. Calypso is immature. Freddie is boring. The side characters are one dimensional. I could go on. But ultimately, these books are a good laugh. The framework of this series is that Calypso, the American student in a British boarding school, is dating Prince Freddie, the British prince. But don't read the books because of that because Freddie is the dullest, stupidest character and he has hardly any time on the page. This series is all about Calypso and her friends going on adventures, getting into scrapes, having fights, sticking up for each other, etc. It is the epitome of what a boarding school book should be. Part of what attracted me to the series was the fencing element. Calypso is a talented fencer. Since fencing is my new hobby, I loved all the scenes of her fencing. Plus the fencing instructor was hilarious. The main dilemma in Dueling Princes is Calypso's mother unexpectedly showing up in England, having left her father. On one hand, Calypso's humiliation at her mother's antics is extremely immature - particularly a scene where she and her mom literally run away from Prince Freddie. Her mom is going through a mid life crisis and should be offered some sympathy and kindness by her daughter. On the other hand, viewing your parents as the most embarrassing creatures on earth is such a teenager thing to do. Calypso acts as most youngish teens would (perhaps she's still on the immature side). I could understand. 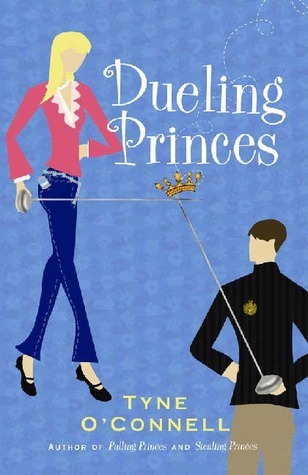 Dueling Princes and the entire Calypso Chronicles series is great fun to read if you want to get a taste of wealthy British boarding school life. The author is from a very posh background and is the mother of boarding school girls, so I think she knows what she's talking about. It's not a brainy read, but well worth picking up. Not sure if I like this book but it does peak my interest. Thanks for sharing. This series sounds fun! Sometimes I really love settling into a good chick flick, and this sounds like the book equivalent. Thanks for putting it on my radar. Investment can be very tricky business depending on where you are investing. It becomes all the more difficult for a beginner but don’t get disheartened because there is always a first time.